So … no Kindle Fire in France yet, the rumours were false, but we do now have the Kindle Touch at €129 and the Kindle Touch 3G at €189. Until yesterday, we just had the Kindle 4 at €99. Amazon has always been tight-lipped about how many Kindles it’s sold in any country, but I can only imagine that sales have been good enough in France to justify introducing the new models. 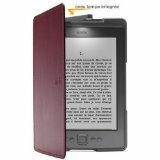 There are now 54,000 Kindle books in French. We lucky expats also have access to the zillions in English that are out there, although we may have to pay slightly more than on Amazon.com or .co.uk, which as you may recall, I have often grumbled about. The French Kindle store is shaping up nicely. There’s a good range of étuis (cases) and housses (covers). Gelaskins have made an appearance too. I think these are fabulous and make a Kindle look very cool. However, I think they’re a bit cheeky shoving lampes à lecture in the Kindle shop, especially as they’re of a rather clunky design. They go better with ordinary books. The covers with built-in lights would be the best thing for Kindles, although they tend to be pricy. Anyway, the signs are good that France is embracing the Kindle so with any luck there’ll be even more models to choose from soon, and more books to read on them.